To the uninitiated, there are a lot of things about drag racing that can cause confusion. There are myriad classes, some of which feature totally dissimilar cars; there are handicapped starts; and, as incredible as it sounds, it’s entirely possible to lose a race by going too fast. But one question that invariably comes up is how that sleek, aerodynamically tweaked, carbon fibre air-brushed blob ever got landed with such a stupid misnomer as ‘Funny Car’. These things are as serious and frightening as a train wreck, and there’s nothing funny about that. The answer lies back in drag racing’s past, they heyday of the sport back in the early 1960s. The sport initially grew up around hot rods, and the cars and classes reflected this. But by the early ’60s, Detroit’s car companies — and Chrysler in particular — were starting to show an interest in selling new cars to the crowds that flocked to watch the races. The philosophy of ‘win on Sunday, sell on Monday’ created the era of match race stockers, in which drivers of subtly modified Fords, Chryslers, and a few die-hard GM independents (who may or may not have received factory support) battled it out weekly, with partisan spectators creating heroes overnight. Racers would try anything to gain the upper hand. In late 1963, Ford put Jack Christman on the road in a nine-second-capable supercharged Mercury Comet to show up unannounced at any race Chrysler’s Ramchargers were attending. In 1963, the Dodges and Plymouths had slight illegal modifications to the wheelbase. In late 1964, they pulled out all the stops, sliding both the front and rear wheels forward massively, gaining more rear overhang for better traction and, at the same time, shortening the actual wheelbase. The sanctioning bodies came up with different names for these cars, including Unlimited Stockers, or Factory Altereds, but the name that stuck was the one the spectators used. The crowd decided these were funny-looking cars. Due to a favourable exchange rate, the last few years have seen an influx of cool machinery onto this country’s drag strips. In a couple of examples, these cars came complete with owners. 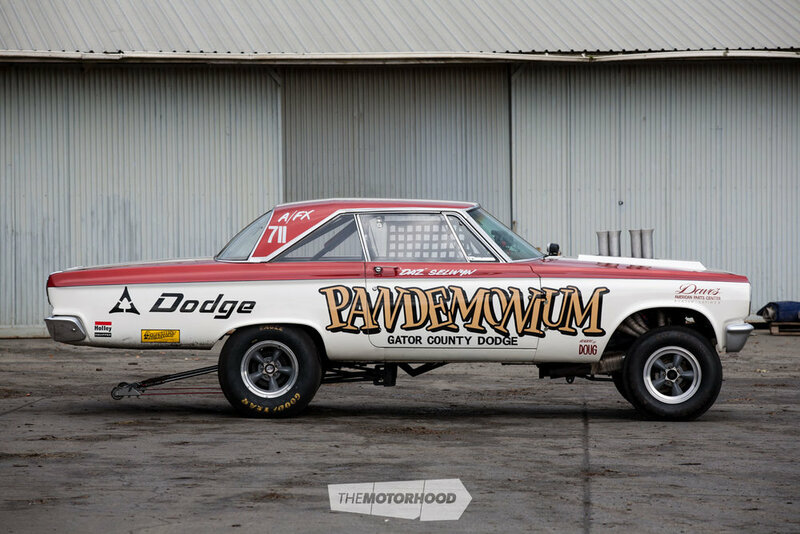 Darren Selwyn and Sarah Gray built up this awesome rendition of a 1960s altered wheelbase match race Super Stocker in the UK, but when the opportunity came to move halfway around the world, Darren planned to sell the unique Dodge. “We came out for a holiday during the summer before we moved, and discovered both a drag strip and a hot rod club, so we decided to bring it with us and continue to play with it,” he says. This ’65 Coronet had been imported into Blighty by its US-based owner to race as a hot street car, and it performed that task admirably for a few years. Normal wear and tear aside, the car had stood up to the rigours well and looked to be exactly what Darren was after: a rolling body minus engine and trans. Cash changed hands and Darren procured a trailer to pick up his new project. The excitement of purchasing his new toy was no doubt still pumping through his veins when a different excitement — probably fear — grabbed his attention. The towing van got into a bit of a speed wobble in peak traffic. Darren drops this into the conversation like it was the easiest thing in the world, but we’re not sure everyone could appreciate it was not exactly the soft option. Without going into great detail, a 305mm section of the rear floor was cut out and tossed into the discarded tin pile, then the rear wheel wells, wheel arches, and all associated and attached panels were cut free, rolled forward 305mm, and welded into position. 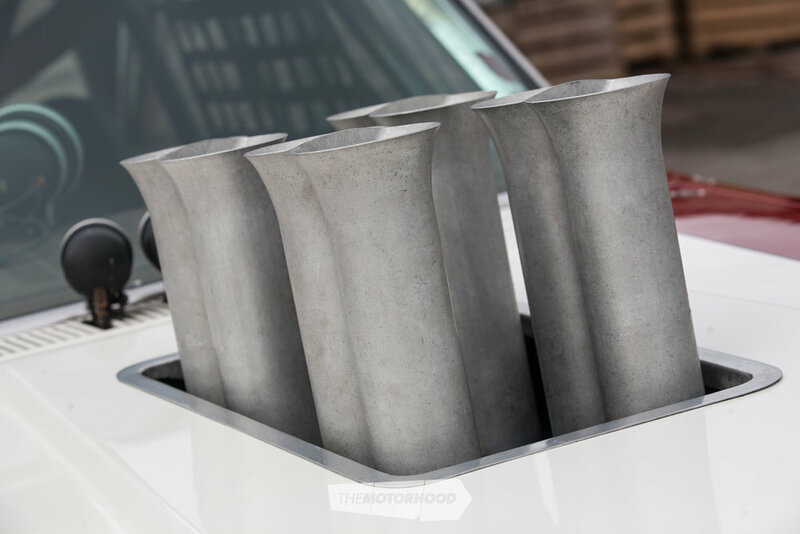 As the Coronet features unibody construction, there is a 10-point roll cage, and various tube cross members were welded into place underneath to help tie the car back together and provide a mount for the new Competition Engineering ladder bars. 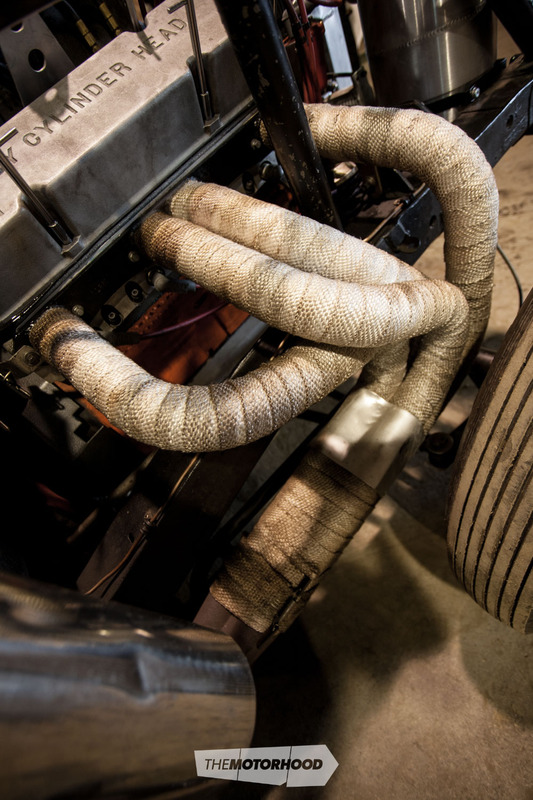 A stock-width 8¾-inch diff was attached to those bars, along with a pair of Avo coilovers. It’s a basic setup, but one that works, and once it was in place the work could begin at the front. Chrysler’s torsion bars and K-member joined the growing junk pile, to be replaced with some hairpin-shaped radius rods and a straight axle.Naturally enough, this is mounted 255mm further forward, placing the front wheels — like the back ones — somewhere other than where the Dodge stylists originally envisaged them. The huge dent and the holes behind the rear wheels where the wheel arches used to be were repaired with steel, but the front guards are fibreglass items, as is the Six Pack–style bonnet, the boot lid, and both bumpers. Dale of DRE in the UK made a mould from the original panels and then cut up the guard moulds to move the front wheel arches forward. The front is not one piece — the Dodge’s bonnet comes off separately, as they did on the ’60s match racers. The 440 Darren bought the car for had a short lifespan, giving two years of hard service before it tossed a rod across the finish line. The replacement is a 493ci Wedge that he hopes will push the much-modified Mopar down the track somewhere in the nine-second range. 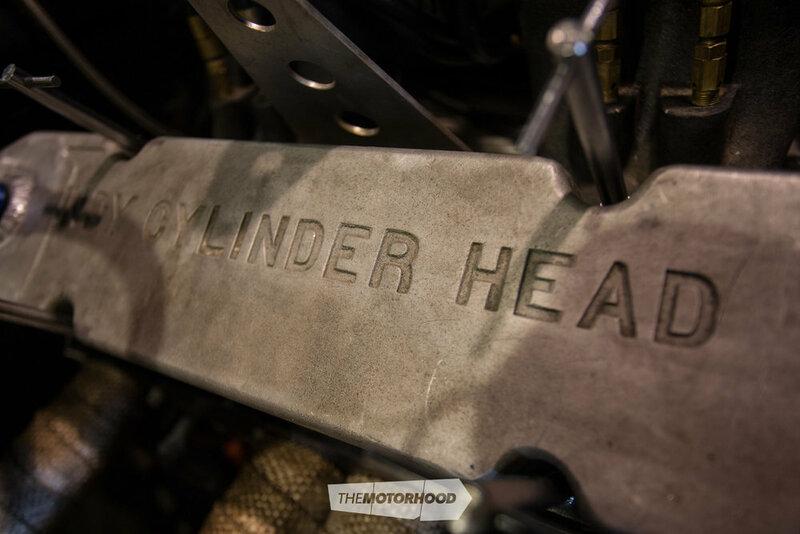 Featuring Indy cylinder heads and an old-school Indy constant-flow mechanical injection system, the motor certainly has the potential. Track time with it has been limited, but the car has been raced at Santa Pod, Shakespeare Raceway, and York Raceway, where Darren claims “first to smell the pigs wins”. 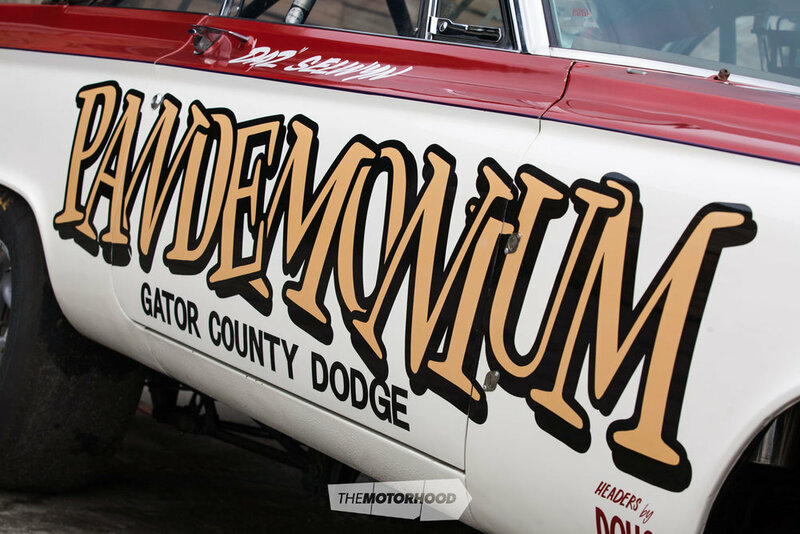 Pandemonium was also a big hit on the European show scene, and Daz was invited to appear at Messukeskus, a big American car show held in Helsinki, Finland, in 2005. 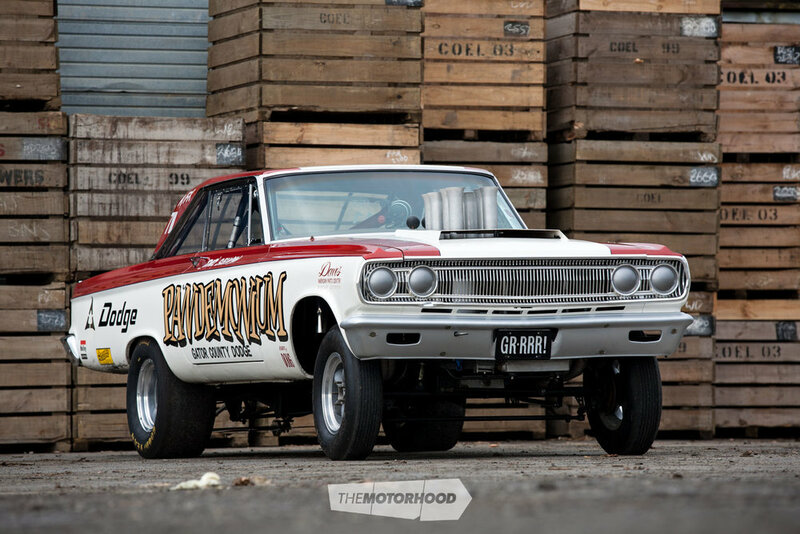 No doubt he’s getting used to all the attention, as the beast also created a bit of a stir at its first appearance at Fram Autolite Dragway [Meremere Dragway] where it raced for the first time at the NZV8 Chrysler/Mopar Nationals. Darren seems a bit nonplussed about all the attention. “It’s just a street car that sort of evolved,” he says, with a shrug. True, but by today’s standards the Dodge has devolved, thank the Lord. And thank some Chrysler engineers, too — without them, the funny car might never have existed.